This year’s Clifford Symposium at DePaul University’s College of Law focuses on a broad range of civil justice topics from torts, civil procedure, to what it means to be a judge. The 2014 Clifford Symposium, named after Chicago-based attorney Robert A. Clifford, will be on April 24th-25th at DePaul University. This year’s symposium explores Judge Jack Weinstein’s leadership in America’s courts while examining the true meaning of seeking justice within today’s civil justice system. The Annual Clifford Symposium celebrates its 20th year. A special address will be given by United States Supreme Court Associate Justice Stephen G. Breyer. The symposium will welcome an expert team of speakers who will discuss an array of civil justice topics. DePaul Alumnus, Robert A. Clifford, founder and supporter of the annual symposium says; “We created this symposium 20 years ago to create a platform to discuss critical issues, foster ideas with rigor and to challenge one another. This year’s event on civil justice opens the floor to create a fair debate on areas of tort law, civil justice, jury performance and the Seventh Amendment.” Robert (Bob) Clifford is the Founder and a Partner of Clifford Law Offices, ranked one of the top Chicago law firms, serving clients nationally and internationally with 19 personal injury attorneys. Bob Clifford has dedicated his life to his profound belief in the vitality of the civil justice system within American society. In 1994 Clifford endowed the first chair on tort law and social policy, which has provided support for research and education while also making the celebrated annual Clifford Symposium possible. 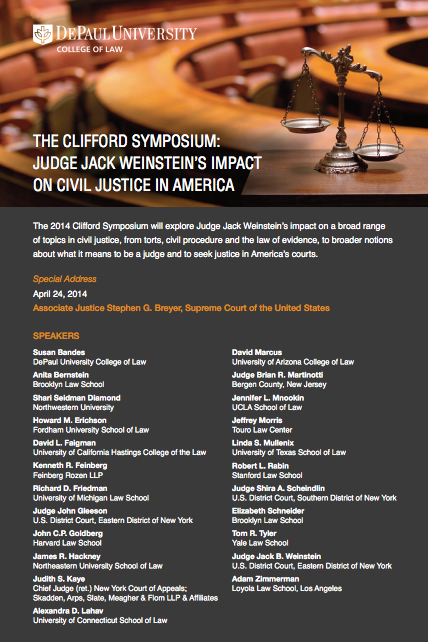 The annual symposium was established as a platform through which Clifford and others within America’s legal community could foster and encourage “intellectually honest discussion and debate” about the American civil justice system. This two-day symposium aims not only to spark scholarly discussion but to create a collective advocacy for advancements in both public and social policy within America. Robert Clifford and an exceptional panel of speakers gather April 24-25 at DePaul University for the 20th annual Clifford Symposium. The distinguished roster of legal experts will commemorate Judge Jack Weinstein’s impact within America’s courts while examining the true meaning of seeking justice within today’s civil justice system. Clifford Law Offices is ranked one of the top law firms in Illinois as well as in the country in the area of complex personal injury and wrongful death cases such as medical malpractice, aviation litigation, products liability, premises liability and transportation litigation. It also has developed a reputation in qui tam litigation or whistleblower cases and handles class action matters as well as commercial litigation cases. Robert Clifford, senior partner at the firm founded in 1985, was named 2012 Chicago Lawyer Person of the Year by Chicago Lawyer magazine and one of the top one hundred most powerful Chicagoans in 2013. He was named the #1 lawyer in the state by Illinois Super Lawyers in 2013. To learn more about Clifford Law Offices or Robert Clifford, visit CliffordLaw.com or call 312-899-9090. The Clifford Symposium 2014The 2014 Clifford Symposium will explore Judge Jack Weinstein’s impact on a broad range of topics in civil justice, from torts, civil procedure and the law of evidence, to broader notions about what it means to be a judge and to seek justice in America. 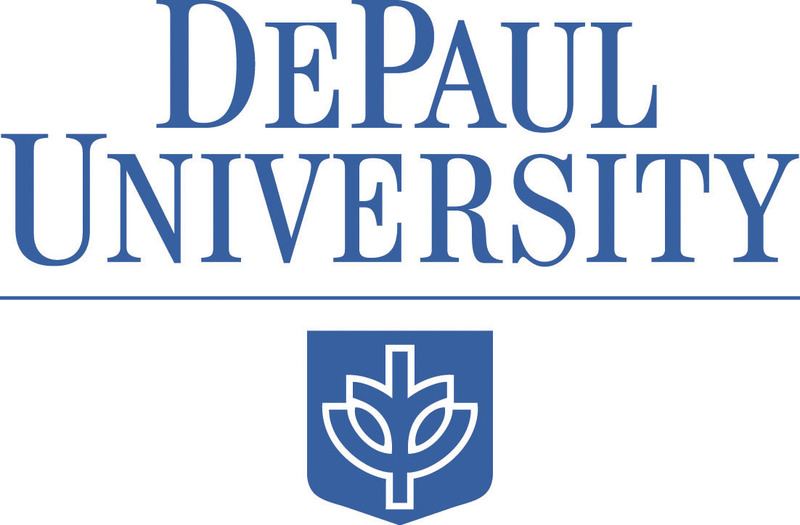 DePaul UniversityDePaul University is a private university in Chicago, Illinois. Founded by the Vincentians in 1898, the university takes its name from the 17th-century French priest Saint Vincent de Paul. Robert A. Clifford, PartnerRobert Clifford is a hard working, dedicated and accomplished aviation accident attorney and personal injury attorney. He was named by Chicago Magazine as one of the top 100 Most Powerful Chicagoans in 2013. Clifford Law OfficesClifford Law Offices is ranked one of the top Chicago law firms, serving clients nationally and internationally with 19 personal injury attorneys.